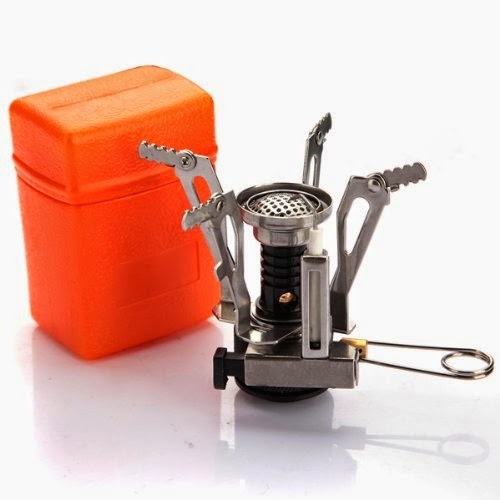 OK, how do I stretch my fuel with my backpacking stove? I do NOT want to run out of fuel before the end of my trip! And why carry more than I have to? What are the tricks to getting good stove fuel economy? Are some stoves more fuel efficient than others? Herein, I address this and more. Read on, dear reader, read on. A Kovea Supalite in use with a heat exchanger pot. Heat exchanger pots save fuel. With most stoves, it's typically more about how you use the stove than it is about which stove you buy – at least with the major stove brands. In other words, the user usually matters more than the stove. However, all bets are off with "no name" stoves that one can buy off of eBay or Amazon for shockingly low prices. Caveat emptor. An uber cheap stove from Amazon. Is it fuel efficient? Who knows? So, what are the "best practices" for fuel efficiency? Here's my list. Items are listed in general order of importance, the most important being listed first. Pick a sheltered spot. On top of a rock or picnic table might be convenient, but it's going to be windier up there. Set up your stove on the ground behind a rock or log. On a windy day, this is absolutely the most important thing to address in terms of efficiency, far more important than how you actually run the stove itself. Turn it down. High heat = inefficient. This is the number one mistake of new stove users – they open the valve 100% (i.e. maximum), which is the absolute last thing that you want to do if you want to be efficient. Running your stove at say 30% of max will be far more efficient. Lower heat = more efficient. Of course it's going to take a bit longer when you turn down the heat. Here's where you'll want to experiment. You need to find the balance between speed and efficiency that works for you. Use a windscreen. Yes, even on an upright type canister stove (like a Pocket Rocket), just not a full 360 degree windscreen. If you use a (partial!) windscreen with an upright canister stove, be careful to check the canister frequently with your hand. If it feels so hot that you can't leave your hand resting on the canister, take immediate steps to cool things down. See Canister Stoves and Wind before you use a windscreen on a canister stove. In general windscreens add to efficiency in two ways. They a) prevent wind from blowing away the heat and b) focus the heat on the pot. Because a windscreen focuses heat, it's always good to use a windscreen even on a day where it isn't particularly windy. Use a lid. A tight fitting lid without a strainer or other openings is best. Escaping steam = escaping heat = inefficient. The above can be used with pretty much any stove and pot combination. There are some additional things that one can do if one is willing to make some additional gear purchases; I list those below. An MSR Windburner uses a heat exchanger pot to achieve high levels of efficiency. Use a wider pot. Tall, skinny pots wind up having flames go up the sides, wasting heat. A wide, squat pot catches that heat better. Use a heat exchanger pot. A heat exchanger pot (e.g. MSR Reactor, Jetboil Flash, Primus Eta Express, etc) can save a lot of fuel. Now, you will save fuel with a heat exchanger , but usually the heat exchanger weighs more than the weight of the fuel you save. In other words, using a heat exchanger is often heavier overall. However, if on a trip you prevent having to carry a larger or second canister, a heat exchanger can actually save you weight. See Can a Jetboil Save Weight? for specific examples and a full discussion. Use a darker colored pot. This is pretty minor compared to the others, but a darker colored pot will absorb more heat than a shiny reflective one. A windscreen makes any stove more fuel efficient. Featured in this photo: A Bobcat system from Flat Cat Gear. OK, so the general rule is that it's more how you use a stove than what stove you buy, but there are exceptions. Alcohol and ESBIT stoves are an exception to my general rule that the user matters more than the stove. With an alcohol or ESBIT stove, you typically have to design the efficiency in. Most DIY alcohol or ESBIT stoves will not be as efficient as a good commercially produced stove. However, do your homework. Just because a stove is commercially produced doesn't mean that it is necessarily efficient. A Ti-Tri Cone from Trail Designs – efficient by design. So, there you have it, some basic tips and tricks for stretching your fuel. Jetboil has announced that they're coming out with a new, lighter weight version of the Jetboil Flash, the Jetboil Flash Lite. Reportedly, the new Jetboil Flash Lite will weigh 11 oz (approx. 312 g) which would make it about 3 oz (85g) less than the current Jetboil Flash which weighs 14 oz (397g). The new Flash Lite should be some consolation to those who bemoan the discontinuation of the Sol line of Jetboils. Some. The Sol was a bit lighter at ~10 ounces (real weight, not the "spin doctored" weight) for the Ti version and ~11 ounces for the Aluminum version. However, the Sol line was only 800 ml capacity. The Flash lite is 1000 ml. 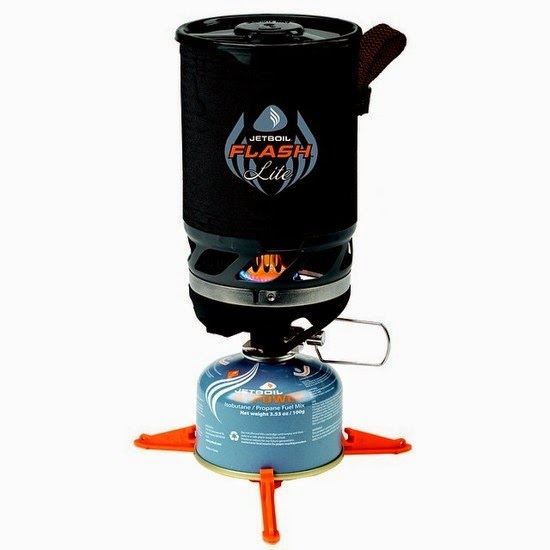 At 11 oz, the Flash Lite would be the lightest integrated canister stove with a full 1000 ml capacity. UPDATE 25 Jan 2015: Well, I was assuming that the Flash Lite was going to be the same volume as the existing Flash. Apparently that is not so. Backpacker Magazine is quoting a volume of 0.8 L. This just about makes the Flash Lite non-news. I mean the aluminum Jetboil Sol was 0.8 L capacity at 11 oz. already. I guess the good news is that you'll be paying $100.00 for a lightweight integrated canister stove instead of $120.00. But note that the Jetboil Zip is also 0.8 L capacity but costs only $80.00. Yes, the Zip weighs about an ounce more, but will people really spend $20 to save one ounce? I haven't seen one yet, but presumably gone is the regulator valve. Other than ~1 ounce weight savings, there doesn't seem to be much to justify the Flash Lite's price tag. How does the Flash Lite stack up against the competition? Well, here's a comparative table of weights and prices. MSRP for the Flash Lite is the same as the Flash, about $100.00. Notes: Weights are generally the manufacturer's stated weights in grams. The notable exception is the weight of the titanium version of the Jetboil Sol. The Jetboil website has "spin doctored" the numbers to make the titanium version appear lighter. My number is based on an "apples to apples" comparison. The weight of individual stoves will vary. Ounces are a calculated figure based on a conversion factor of 28.3495. Stoves are sorted in order of weight with the lightest stove first. *The production MSR Windboiler units have been coming in about an ounce heavier than the prototype units that this weight was based on. One potential downside is the "handle." The handle appears to be just a small little loop. I'm not convinced that's a good move. I'll have to take a look when I can get my hands on one. Photo courtesy of Trail to Summit. UPDATE 22 Jan 2015: I just now saw a photo taken at OR (the Outdoor Retailer convention). See above. In it the Flash Lite has an orange cozy. Not sure if that's a pre-production copy or what. I think the black cozy shown in the photo above is a lot sharper looking. Of course, out in the backcountry, who cares what your pot cozy looks like. I just mention that so people know that the Flash Lite may not look exactly like the press release photo I first posted. The above photo comes to us courtesy of Trail to Summit. If you haven't yet read some of the postings over at Trail to Summit, I say check it out. Lots of great stuff over there like this John Muir Trail Guide. Even if you're not planning to hike the JMT, there are a lot of good gear recommendations and lists. I don't have a projected availability date. 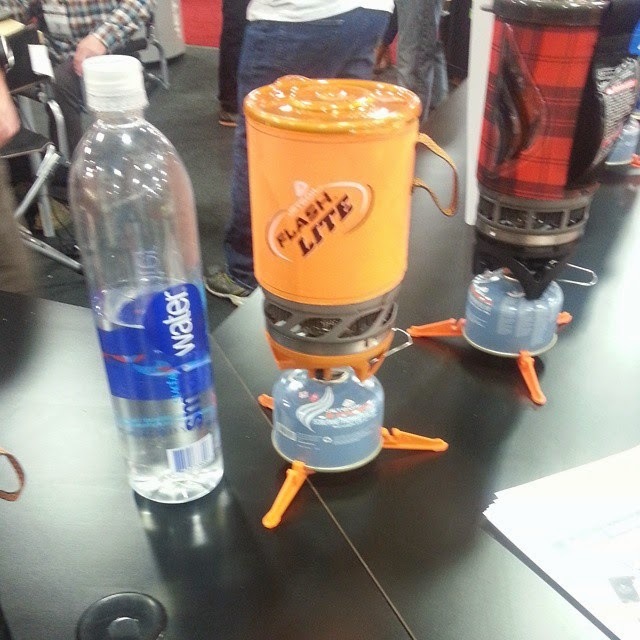 If Jetboil is smart, they'll have these ready for the 2015 through hiking season which begins in April (well, for the PCT anyway, but spring generally is the start of through hike season). UPDATE 6 Feb 2015: Jetboil has announced a target date of June 2015 for public availability of the new Jetboil Flash Lite. That's all I've got for now. More updates as information becomes available.